Reading files in Java is the cause for a lot of confusion. 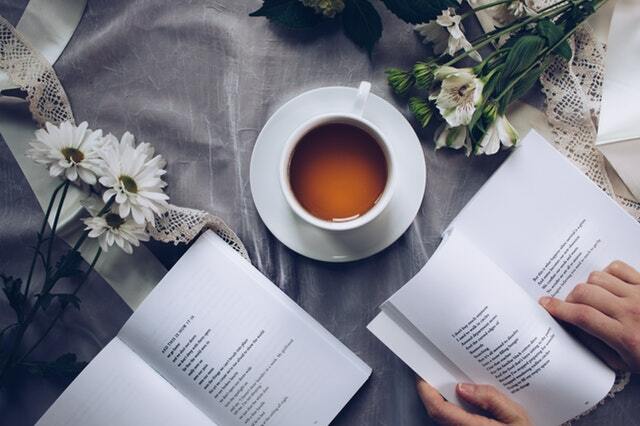 There are multiple ways of accomplishing the same task and it’s often not clear which file reading method is best to use. Something that’s quick and dirty for a small example file might not be the best method to use when you need to read a very large file. Something that worked in an earlier Java version, might not be the preferred method anymore. This article aims to be the definitive guide for reading files in Java 7, 8 and 9. I’m going to cover all the ways you can read files in Java. Too often, you’ll read an article that tells you one way to read a file, only to discover later there are other ways to do that. I’m actually going to cover 15 different ways to read a file in Java. I’m going to cover reading files in multiple ways with the core Java libraries as well as two third party libraries. But that’s not all – what good is knowing how to do something in multiple ways if you don’t know which way is best for your situation? I also put each of these methods to a real performance test and document the results. That way, you will have some hard data to know the performance metrics of each method. When there is an incompatibility, it will be stated in that section. Otherwise, the code works unaltered for different Java versions. The main incompatibility is the use of lambda expressions which was introduced in Java 8. Prior to JDK7, when opening a file in Java, all file resources would need to be manually closed using a try-catch-finally block. JDK7 introduced the try-with-resources statement, which simplifies the process of closing streams. You no longer need to write explicit code to close streams because the JVM will automatically close the stream for you, whether an exception occurred or not. All examples used in this article use the try-with-resources statement for importing, loading, parsing and closing files. All examples will read test files from C:\temp. Character encoding is not explicitly saved with text files so Java makes assumptions about the encoding when reading files. Usually, the assumption is correct but sometimes you want to be explicit when instructing your programs to read from files. When encoding isn’t correct, you’ll see funny characters appear when reading files. Default system encoding where no encoding is specified and explicitly setting the encoding to UTF-8. All code files are available from Github. There is a difference between writing code for your personal or work project and writing code to explain and teach concepts. If I was writing this code for my own project, I would use proper object-oriented principles like encapsulation, abstraction, polymorphism, etc. But I wanted to make each example stand alone and easily understood, which meant that some of the code has been copied from one example to the next. I did this on purpose because I didn’t want the reader to have to figure out all the encapsulation and object structures I so cleverly created. That would take away from the examples. For the same reason, I chose NOT to write these example with a unit testing framework like JUnit or TestNG because that’s not the purpose of this article. That would add another library for the reader to understand that has nothing to do with reading files in Java. That’s why all the example are written inline inside the main method, without extra methods or classes. My main purpose is to make the examples as easy to understand as possible and I believe that having extra unit testing and encapsulation code will not help with this. That doesn’t mean that’s how I would encourage you to write your own personal code. It’s just the way I chose to write the examples in this article to make them easier to understand. All examples declare any checked exceptions in the throwing method declaration. The purpose of this article is to show all the different ways to read from files in Java – it’s not meant to show how to handle exceptions, which will be very specific to your situation. So instead of creating unhelpful try catch blocks that just print exception stack traces and clutter up the code, all example will declare any checked exception in the calling method. This will make the code cleaner and easier to understand without sacrificing any functionality. As Java file reading evolves, I will be updating this article with any required changes. Classic I/O classes that have been part of Java since before JDK 1.7. This includes the java.io and java.util packages. New Java I/O classes that have been part of Java since JDK1.7. This covers the java.nio.file.Files class. Third party I/O classes from the Apache Commons and Google Guava projects. FileReader reads in one character at a time, without any buffering. It’s meant for reading text files. It uses the default character encoding on your system, so I have provided examples for both the default case, as well as specifying the encoding explicitly. BufferedReader reads an entire line at a time, instead of one character at a time like FileReader. It’s meant for reading text files. FileInputStream reads in one byte at a time, without any buffering. While it’s meant for reading binary files such as images or audio files, it can still be used to read text file. It’s similar to reading with FileReader in that you’re reading one character at a time as an integer and you need to cast that int to a char to see the ASCII value. By default, it uses the default character encoding on your system, so I have provided examples for both the default case, as well as specifying the encoding explicitly. BufferedInputStream reads a set of bytes all at once into an internal byte array buffer. The buffer size can be set explicitly or use the default, which is what we’ll demonstrate in our example. The default buffer size appears to be 8KB but I have not explicitly verified this. All performance tests used the default buffer size so it will automatically re-size the buffer when it needs to. The Files class is part of the new Java I/O classes introduced in jdk1.7. It only has static utility methods for working with files and directories. The readAllLines() method that uses the default character encoding was introduced in jdk1.8 so this example will not work in Java 7. This code was tested to work in Java 8 and 9. Java 7 didn’t run because of the lack of support for lambda expressions. Just like in the previous example, this code was tested and works in Java 8 and 9 but not in Java 7. The Scanner class was introduced in jdk1.7 and can be used to read from files or from the console (user input). Even though the documentation for this method states that “it is not intended for reading in large files” I found this to be the absolute best performing file reading method, even on files as large as 1GB. Apache Commons IO is an open source Java library that comes with utility classes for reading and writing text and binary files. I listed it in this article because it can be used instead of the built in Java libraries. The class we’re using is FileUtils. Note that you need to explicitly specify the encoding and that method for using the default encoding has been deprecated. Google Guava is an open source library that comes with utility classes for common tasks like collections handling, cache management, IO operations, string processing. I listed it in this article because it can be used instead of the built in Java libraries and I wanted to compare its performance with the Java built in libraries. For this article, version 23.0 was used. I’m not going to examine all the different ways to read files with Guava, since this article is not meant for that. For a more detailed look at all the different ways to read and write files with Guava, have a look at Baeldung’s in depth article. When reading a file, Guava requires that the character encoding be set explicitly, just like Apache Commons. Compatibility note: This code was tested successfully on Java 8 and 9. I couldn’t get it to work on Java 7 and kept getting “Unsupported major.minor version 52.0” error. Guava has a separate API doc for Java 7 which uses a slightly different version of the Files.readLine() method. I thought I could get it to work but I kept getting that error. Since there are so many ways to read from a file in Java, a natural question is “What file reading method is the best for my situation?” So I decided to test each of these methods against each other using sample data files of different sizes and timing the results. Each code sample from this article displays the contents of the file to a string and then to the console (System.out). However, during the performance tests the System.out line was commented out since it would seriously slow down the performance of each method. Each performance test measures the time it takes to read in the file – line by line, character by character, or byte by byte without displaying anything to the console. I ran each test 5-10 times and took the average so as not to let any outliers influence each test. I also ran the default encoding version of each file reading method – i.e. I didn’t specify the encoding explicitly. GitHub doesn’t allow pushing files larger than 100 MB, so I couldn’t find a practical way to store my large test files to allow others to replicate my tests. So instead of storing them, I’m providing the tools I used to generate them so you can create test files that are similar in size to mine. Obviously they won’t be the same, but you’ll generate files that are similar in size as I used in my performance tests. There were some surprises and some expected results from the performance tests. As expected, the worst performers were the methods that read in a file character by character or byte by byte. But what surprised me was that the native Java IO libraries outperformed both 3rd party libraries – Apache Commons IO and Google Guava. What’s more – both Google Guava and Apache Commons IO threw a java.lang.OutOfMemoryError when trying to read in the 1 GB test file. This also happened with the Files.readAllLines(Path) method but the remaining 7 methods were able to read in all test files, including the 1GB test file. The new Java I/O libraries (java.nio) had the best overall winner (java.nio.Files.readAllBytes()) but it was followed closely behind by BufferedReader.readLine() which was also a proven top performer across the board. The other excellent performer was java.nio.Files.lines(Path) which had slightly worse numbers for smaller test files but really excelled with the larger test files. The absolute fastest file reader across all data tests was java.nio.Files.readAllBytes(Path). It was consistently the fastest and even reading a 1GB file only took about 1 second. You can see that the lowest times were for Files.readAllBytes(), BufferedInputStream.read() and BufferedReader.readLine(). Files.readAllBytes() really outperforms all other methods and BufferedReader.readLine() is a distant second. As expected, the absolute worst performer was java.io.FileInputStream.read() which was orders of magnitude slower than its rivals for most tests. FileReader.read() was also a poor performer for the same reason – reading files byte by byte (or character by character) instead of with buffers drastically degrades performance. Both the Apache Commons IO FileUtils.readLines() and Guava Files.readLines() crashed with an OutOfMemoryError when trying to read the 1GB test file and they were about average in performance for the remaining test files. java.nio.Files.readAllLines() also crashed when trying to read the 1GB test file but it performed quite well for smaller file sizes. 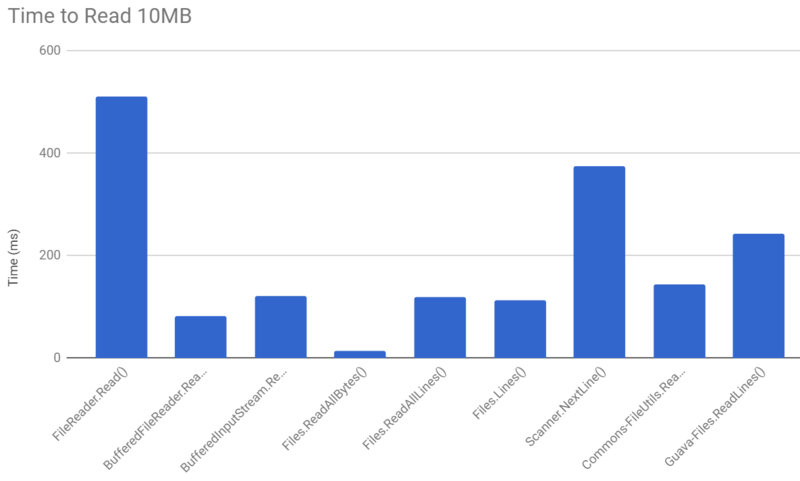 Here’s a ranked list of how well each file reading method did, in terms of speed and handling of large files, as well as compatibility with different Java versions. I tried to present a comprehensive set of methods for reading files in Java, both text and binary. We looked at 15 different ways of reading files in Java and we ran performance tests to see which methods are the fastest. The new Java IO library (java.nio) proved to be a great performer but so was the classic BufferedReader.